A stress fracture is a hairline fracture in a bone caused by overuse. In the foot, the Navicular stress fracture is the most common but they can occur in a number of bones in the foot and heel. A calcaneal stress fracture is a hairline fracture calcaneus or heel bone. It is usually caused by overuse and is more common in soldiers who march long distances and road runners. Treatment involves resting for 6 to 8 weeks followed by a gradual return to full training and fitness. Symptoms of a calcaneal stress fracture may be similar to that of a bruised heel. Pain will come on gradually over time and will often be made worse with weight-bearing activity such as running and jumping. It may be difficult to differentiate between a bruised heel and a stress fracture. Often an X-ray of the injured bone will not show any sign of fracture until the fracture has actually started to heal, which will be around 2 to 3 weeks later. It is possible that a stress fracture will not appear on an X-ray at all. Bone scans and MRI scans are more likely to be of assistance in diagnosing a calcaneal stress fracture. One test to help diagnose a stress fracture of the heel bone is the ‘squeeze test’. The therapist squeezes the back of the heel from both sides. If pain is reproduced then the test is positive and this may be an indication of a stress fracture. A bruised heel is unlikely to be affected in the same way with this test. A calcaneal stress fracture is a hairline crack or fracture in the heel bone (calcaneus). It is an overuse injury which was seen mostly in soldiers marching long distances carrying heavyweights. However, they are also seen in long-distance runners, ballet dancers and sports involving jumping. They are the second most common stress fracture of the foot after navicular stress fractures. If a stress fracture is suspected, then complete rest is advised for 6 to 8 weeks. Stay off your feet as much as possible and refrain from any weight-bearing exercise. Use crutches if possible. Often injured athletes on crutches get far more sympathy and understanding than those who might hobble around with an injury that is not clearly visible. If crutches are not a viable alternative then wear comfortable training shoes with a cushioning midsole rather than hard, flat work shoes. If you have to wear hard-soled shoes then use a gel heel pad or cushioning insole to help protect the heel and allow it to rest. It is important to maintain fitness with non-weight-bearing activities such as swimming or cycling. See a sports doctor or professional practitioner who can confirm the diagnosis and advise on treatment. In some cases, a plaster cast is applied for 2 – 6 weeks if the pain is severe. This will ensure complete rest. When the athlete does start back running they must ensure the muscles in the lower leg are stretched and supple. A gradual return to full training is important. A navicular stress fracture is one of the most common stress fractures affecting athletes, especially those in explosive events such as sprinting and jumping. The navicular bone is in the ankle and can be fractured by overuse and repetitive stress. With this injury, there may be pain in the arch of the foot which increases during activity. Symptoms of a navicular stress fracture include a poorly localized ache in the midfoot which gets worse with exercise. Pain may radiate along the inside arch of the foot and goes away quickly with rest, only to return again as training resumes. Tenderness may be felt when the thumb is pressed into the top of the foot over the navicular bone, called the N spot. The navicular is one of the tarsal bones in the ankle. It sits on top of the calcaneus or heel bone. A stress fracture of the navicular is caused by overuse or repetitive strain, usually from high impact sports such as sprinting, hurdling and jumping. Poor technique or training errors can also contribute to the likelihood of sustaining a stress fracture of the foot. The exact mechanism of injury is not known although it is thought the navicular bone gets pinched or impinged between the bones to the front and back of it causing it to be compressed. If the athlete has a reduced range of dorsiflexion (moving the foot upwards) in the ankle then they are more susceptible to a navicular stress fracture as the midfoot has to compensate for the lack of movement. An X-ray may or may not show the appearance of a stress fracture, therefore, a bone scan or MRI is of more use. Treatment of a navicular stress fracture may depend on severity. It the injury is classed as a stress reaction where the outer part of the bone has not fractured then weight bearing rest in a walking splint may be recommended until symptoms have gone followed by a gradual return to full fitness. If a stress fracture is diagnosed then complete non-weight-bearing in a full cast for a period of 6 weeks is essential. After 6 weeks the N spot over the top of the navicular bone is felt. If it is tender then the cast is re-applied for a further 2 weeks non-weight-bearing. If there is a separation of the navicular bone or the fracture fails to heal then surgery may be required to fix the bone with a pin or screw. Once the cast has been removed it is important to mobilize the foot and ankle which will have been kept still for at least 6 weeks. Ankle mobility exercises and strengthening exercises should be done before starting to run again. Calf raises and exercises for the small muscles in the foot are important. Sports massage for the calf muscles can help restore them more quickly to normal function speeding up the rehabilitation process. It is also important to eliminate factors which are likely to cause the injury to recur. Training errors in terms of technique or overtraining should be identified. A podiatrist can check if there are any biomechanical factors such as over pronation of the foot which should be corrected with orthotic inserts in the shoes. Tarsal coalition where the tarsal bones fuse together as well as restricted dorsiflexion of the ankle will also make the athlete more susceptible to a future navicular stress fracture. When full ankle mobility and basic strength of the joint has been restored which will usually take a week or more then running can resume. Training should be very very gentle to start with aiming to build up to resuming normal training loads over a period of at least 6 weeks. Symptoms include pain in the foot which occurs gradually. The pain will be located towards the middle or front of the foot and is made worse by weight-bearing activities such as walking, running or dancing. There may be a specific tender spot which is painful to touch at the point of fracture. Swelling is often present, although an X-ray will often not show the fracture until two or three weeks after it has started to heal. Metatarsal fractures can be either an acute fracture or a stress fracture. They can be fractured through impact, for example, a vicious football stud (acute fracture), or through a more gradual onset, where repetitive impact causes a stress fracture. This usually will involve the second, third or fourth metatarsal bones. Stress fractures to the metatarsals are the second most common location for a stress fracture, after the Tibia. 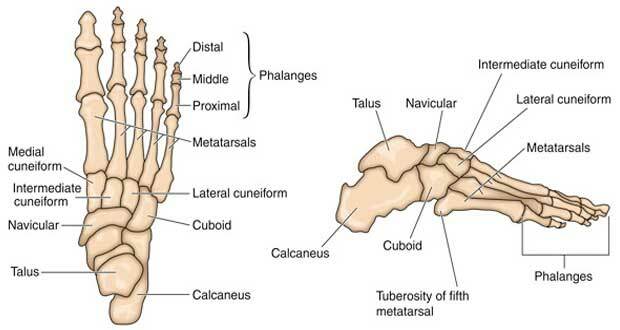 The most common position for a metatarsal fracture is the second metatarsal, especially in those whose second toe is longer than their big toe. It is also more common in those who overpronate with the first metatarsal in a dorsiflexed position as this places a greater load on the 2nd metatarsal. Stress fractures in the other metatarsals are less common, although they do occur. Too much training, too soon without enough rest! They are common in army recruits (often called a march fracture), runners, ballet dancers, and gymnasts. Rest from weight-bearing activities as much as possible. For those whose job requires them to weight bear, a walking boot may be used. The rest period should normally be around 4 weeks to allow sufficient healing. Recommence activities only once all pain on touch and walking have cleared. Start with a very slow return to activity and a gradual build of duration and intensity. If the stress fracture may have been caused by abnormal foot mechanics such as overpronation or oversupination then orthotics may be required to correct this. 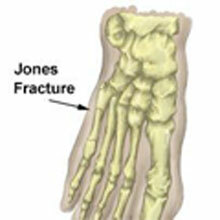 Jones fracture is a fracture of the 5th metatarsal bone on the outside of the foot, at the end of the bone nearest the ankle. Overuse or turning the ankle can cause the fracture. The main symptom is pain on the outside of the foot and difficulty in putting weight on it. Medical help and x-rays will be needed to heal this foot injury. The time taken to return to full training after a surgical fixation operation is around 8 weeks, although it is recommended for full healing to be seen on a radiographic image before full training is resumed.